Introducing Collectorz.com Core – now live for books! 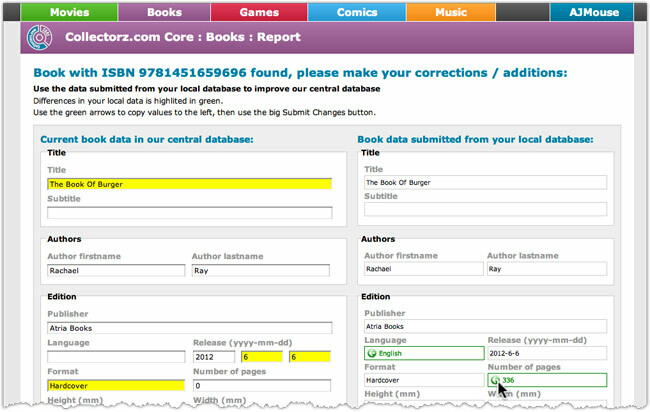 Core is a new system that lets all Collectorz.com users help us improve the quality and completeness of our central online databases. It will replace the current “Submit to Collectorz.com” system. But Core is more than that, as it also lets you report data errors, missing entries and missing barcodes. The book edition of Collectorz.com Core is live now and fully integrated in today’s 8.1 release of Book Collector for Windows. At Collectorz.com, we are running our own central online databases for movies, books, music, comics and video games. These online databases are the source of all data that you get when using the Add Automatically screen in your Collector software. Most of the data in these online databases is retrieved from 3rd party data feeds, but a large part is provided by you and your fellow users, through the Submit to Collectorz.com feature in your software. It is this Submit system that has helped us grow the completeness and quality of our online database since their start back in 2005. In the first few years, while we were still building and growing the databases, our focus was on quantity and coverage. That is, we were trying to get as many movies, books, CDs, comics and games listed as quickly as possible. This focus on quantity meant that we were happy to see many users just submit their entire database to us, with our content managers weeding out the bad data from the useful entries as well as they could. However, our current online databases have grown to enormous proportions, delivering sufficient coverage for most users. So it is time to change our focus from quantity to quality. That is, a new focus on providing better and more complete data for your collectibles. Submit more data. E.g. to add missing credits, plots, cover images, etc… to existing entries in our online database. Of course using the data already present in your local database. Report missing entries. E.g. to add movies, books, CDs, comic and games that are not in our database at all (yet). Report missing barcodes. E.g. add the barcode for a specific DVD edition of a movie already present in our database. you are now able to immediately add the book to our central database. you entered for your local Book Collector database. processed by our content managers as soon as possible. Edit Book to submit your local data to Core, to improve your central data. All Core functionality will be added to Book Collector for Mac soon.